The tourist brochure shows pictures of lovely white sandy beaches, tall coconut trees and rolling mountains. Welcome to the Caribbean. But the picture has been changing in recent years as Caribbean countries grapple with millions of tonnes of household waste that sometimes scar the landscape. Now there is a glimmer of hope. A United Kingdom-based Waste to Energy firm is partnering with some Caribbean countries to set up plants that will convert garbage into electricity and potable water, and in the process transform the region from its dependence on fossil fuel. "The Caribbean is a wonderful area but what you haven't got is the land or the resources," Tony Fiddy, the President of the Waste to Energy Division and the Regional Vice President for Europe and Africa of Naanovo Energy Inc., told IPS. "If you want to put solar up, you need big solar fields, if you want to use wind, you need big wind fields. But what you do have (right now)? You have waste." Naanvovo burns waste in an incinerator plant to produce seven megawatts of power and 36,000 litres of potable water from 180 tonnes of waste. The firm says that with modern pollution control equipment, plant emissions are virtually non-existent, representing little or no risk to the environment or to the health and safety of people living near the plant. The benefits of investing in green energy were highlighted during the first-ever Green Investment Forum at a Caribbean Sustainable Tourism conference which wrapped up here on Wednesday. The Barbados-based Caribbean Tourism Organisation (CTO), which organises the yearly conference, partnered with Invest Caribbean Now, a brand founded by Felicia Persaud, the Guyana-born chief executive officer of a New York-based digital media company, to present the inaugural green forum. Persaud urged delegates to look at the economic prospects of green energy and renewables and the potential for the region. "Guyana and the Caribbean are filled with an abundance of sunshine, wind, water and other natural resources," she said, adding "let us be very clear that investing in clean energy is not just environmentally responsible but good business because no region offers long term prospects in growth for renewable energy than the Caribbean." The United Nations Environment Programme (UNEP) last year noted that investors pumped a record 211 billion dollars into renewables globally, with72 billion invested in developing countries. While South and Central America secured 13.1 billion of that amount, the Caribbean did not even get a cent. "So it is a challenge to the Caribbean region to position itself to take advantage of this new sector sustainably and with transparency. Our leaders must begin to think outside the box and be unafraid to move beyond the traditional sectors – for instance out of a dying sugar industry to ethanol," Persaud said. "We must tap investment into this sector to create new jobs and limit our dependence on the up and down prices of oil and grow our economies like our south American neighbours and really make a mark on this generation." Naanvovo has invested 50 million dollars in St. Kitts to build a seven megawatt plant and is also in discussions with Jamaica and St. Lucia to set up similar projects in those countries. The projects, which are set up under what's called a BOOT (Build, Own, Operate and Transfer) agreement, would be transferred to the respective governments after 25 years. 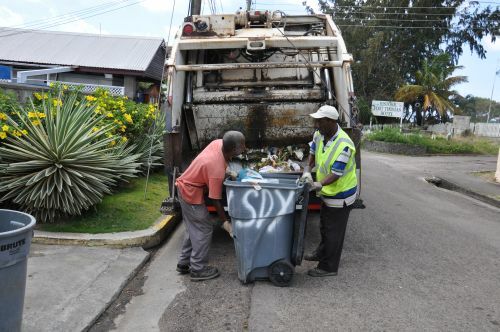 Fiddy said St. Kitts, with close to 50,000 people, currently has 130 tonnes of waste. Under the project, which is now awaiting final approval from the Denzil Douglas government, the present landfill will be shut down and waste, up to five years old, converted to energy. "We have made our presentation to government, we have lobbied people, and because St. Kitts doesn't have in-house people to prove the technology, they have used the Organisation of American States who have approved the project and our managing director down there is awaiting a meeting with the prime minister to give it the go-ahead," Fiddy said. "St. Lucia has 80,000 people so that tells me there is enough waste there to put 14, maybe 21 megawatts there. Jamaica has 2.8 million people and we are talking to them about doing a 21 megawatt plant." Fiddy said the Caribbean and the world are losing energy daily, with fossil fuels drying up and worsening climate change, and he firmly believes that converting waste to energy is the way to go. He said the Caribbean represents a huge potential for renewable energy projects, primarily because of the ideal climate conditions for solar, wind and biomass power production. "What we have done in our organisation, we have developed technology where we take what you put in your dustbin and we turn it into energy," he said. Guyanese President Donald Ramotar said that waste is a major problem for his country, particularly in the capital Georgetown and along the coast. "We are doing a lot of education now generally to tell people not to litter so we are tackling it," he told IPS. "We are also looking at other technologies that we can use and we are looking at recycling. We have been even offering companies that want to set up here in recycling, we are going to give them tax-free concessions. "There are some small companies which have started to do recycling. They are beginning to see that they can make some money from it but I think it has to be at a much larger scale," Ramotar added. Waste to Energy is becoming more and more popular in many parts of the world because it represents a solution to landfills and offers excellent potential for combusting regular household trash into valuable energy such as in the form of electricity, steam or hot water. Noting that low grade bunker-C power plants were still common in the Caribbean, Fiddy said his company was poised to play a greater role in the future to help the Caribbean region transform itself away from fossil-fuels and into alternative energy. "Our solar power, waste to energy and biomass energy solutions will help us do that and we look forward to being part of this transformation," he said. "What governments in the Caribbean region need to do is to open the door for companies like ours to show them how it can be done and to take the bold steps necessary to invest in these kinds of alternative energy solutions," he added.